Stay home as long as possible. Arriving in active labor or when your provider tells you to arrive. Use upright positions, shower, TENS units, and a balance of rest. A good rule of thumb is rest for 20-30 minutes and use upright active positions for the next 30-40 minutes. Playing music, dancing or walking outside, going to the movies, cooking, and eating are excellent ways to help pass the time. But if the mom is managing well resting or is asleep, do not wake her. When the epidural is desired help mom to stay focused on her labor, breathing through each contraction using the comfort techniques from above. It can take a hour to verify blood work, run the necessary IV fluids, and get anesthesia in the room. For many women this is the most stressful part, as the contractions appear unbearable when faced with relief. Clean and organize the room, as anesthesia may need more space than you realized. Collect all your items and organize them in the corner next to the chair or couch. The partner should have something to eat or drink, in the event they are allowed to stay in the room. The most important thing is to listen to the nurse and the anesthesiologist. As they will be walking you both through the sterile procedure. Many hospitals do not allow the partner to stay in the room during the placement. If this is the case, this is an excellent ice to grab a bite to eat and get some fresh air. However, if you are allowed to stay, expect to be sitting facing the mother, not touching her but offering her your silent support. The nurse will be in the room for the first 20-30 minutes. She will be charting, taking blood pressure, checking in with the mother, and preparing next steps. The mother will be layed on her back with a wedge under one hip. The epidural is gravity fed and mom needs to be flat to get equal coverage. Once she is numb, the nurse will place a Foley catheter to drain the mother’s bladder as she can no longer get up to pee. She may need her partner bedside, holding her hand, or chatting with her. After the Foley is placed, encourage her to sleep. Lower the lights, cover her eyes if needed, and prepare to take a nap yourself. The nurse or doula may adjust mom’s positions after the Foley is placed and mom is comfortable. Many hospitals use peanut balls to assist when with epidurals. The peanut ball positions may seem awkward, but most women sleep well with the ball. If a ball is not a viable use pillows between her knees and at her back for support. Your nurse or doula may come in to adjust her position as needed. She may also come in to adjust the monitors and prepare the room for delivery. If the mother is unable or not interested in resting she may need distractions to pass the time. Watching TV, massage, fluids, handholding, day dreaming, and all form of love are helpful. Most hospitals practice ‘laboring down’. This means giving the mother 30-60 minutes after she is found to be complete or 10 cm, to help her bring her baby down further in to the pelvis. The nurse or doula may change the mother’s position again to a gravity bearing position. Pushing can take longer than expected with an epidural due to the lack of sensation. 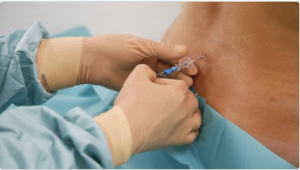 Some women may request the epidural to be reduced to facility pushing. A variety of positions can be used even with an epidural, such as side lying positions, hands and knees, and even tug-of-war to assist with delivery. She will need sips of fluids between pushes and even chap stick. Fan her face, lay a cool wet washcloth on her forehead, and be supportive and positive. Once the baby arrives focus on the baby. Count fingers and toes. Note the hair and facial features. Offer mom sips of fluid and something to eat once the medical team clears her to eat. The epidural can take 2 hours to wear off. Getting up to pee can be challenging and it is important to follow staff guidelines until mom feels herself. If you are at all unsure, at any time, call you nurse and ask for assistance.